Thank God last week is over! We had snow!!! (the fun part) and car problems (not fun especially on “extreme weather conditions”- which were not extreme at all, but still there was snow and the town was shut down). So, who’s up for some kale? Everybody loves kale, I just started experimenting with it. I don’t like kale chips, that’s for sure but I really like it with egg! This was my breakfast yesterday, today I sote the kale a little bit and if you like kale chips you should try it like that. I liked it both ways, so… follow your tastes. Cut the shiitake mushrooms in smaller pieces and sauté them in a frying pan with a little bit of olive oil. When the mushrooms are almost ready, crack the egg in the same pan salt &pepper and cover with a lid. I like my egg not too runny so I usually turn it on the other side as well. 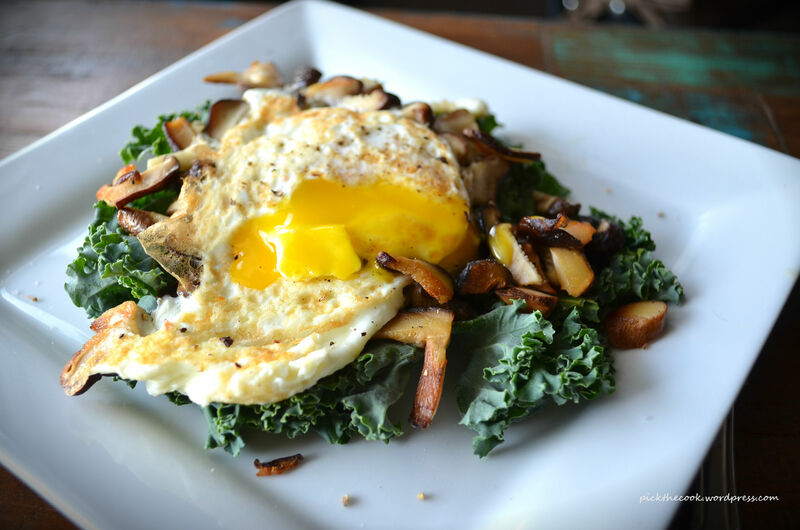 place the egg and the shiitake on a plate and sauté the kale in a drop of olive oil.